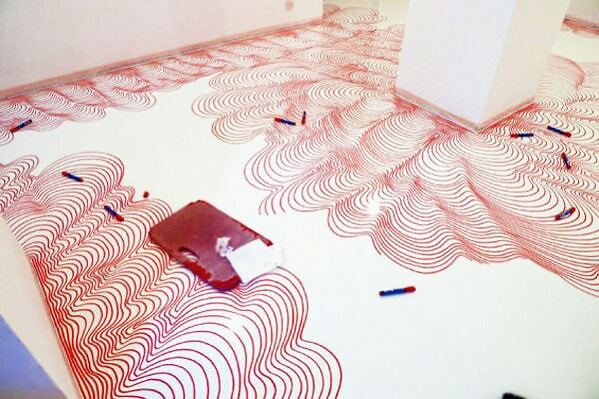 Drawing Marker and Penny Floors – – You can use just about anything around the house to update your home decor. But, did you know you can DIY your floor? 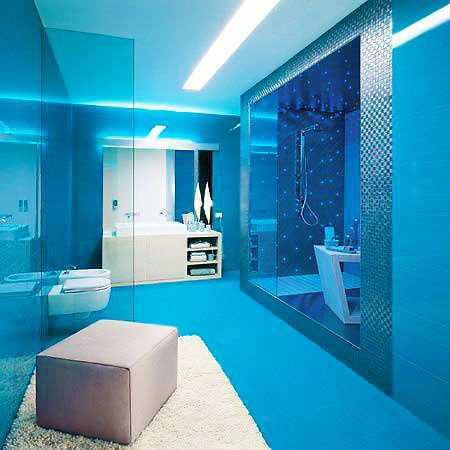 Two designs that have hit international headlines are proving that all you need is a little inspiration to create floors that are do-it-yourself works of art. “We’d been looking up options and were thinking about being green when I said we should just tile the floor in pennies,” Ryan Lange told NBC News this week. He was explaining the inspiration behind his and girlfriend Emily Belden’s penny floor, a masterpiece of bedroom tiling made up of 59,670 pennies. Painstakingly gluing their change jar’s contents to the 324 square foot floor and sealing it with a clear coat took a total 128 hours, and many dirty hands. “Once we were halfway done, we were kind of over it,” Lang said. But the final product was worth the penny pains. “We fell in love with the variation in color among the pennies. Some are bright and shiny. Others are weathered with a unique teal hue to them. Some are dark and antiqued,” Belden told local the Chicagoist newspaper. 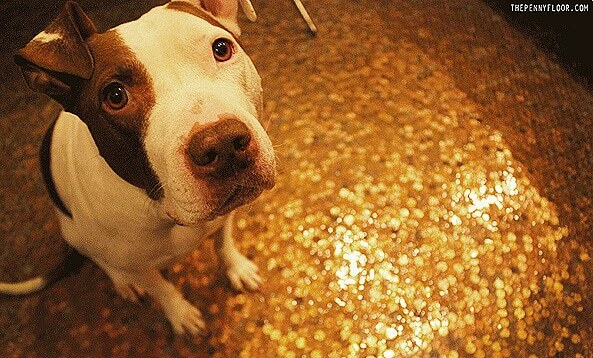 Their idea is pretty groundbreaking on the home-front, but penny floors have been seen popping up in shops and bars across the country, including the swanky Standard Grill in the Standard Hotel in New York City. But the fact that you can create a space that high profile designers spend millions on is worth the hard work – and the penny saved! But, penny floors have nothing on the intricate design of the permanent marker floor. 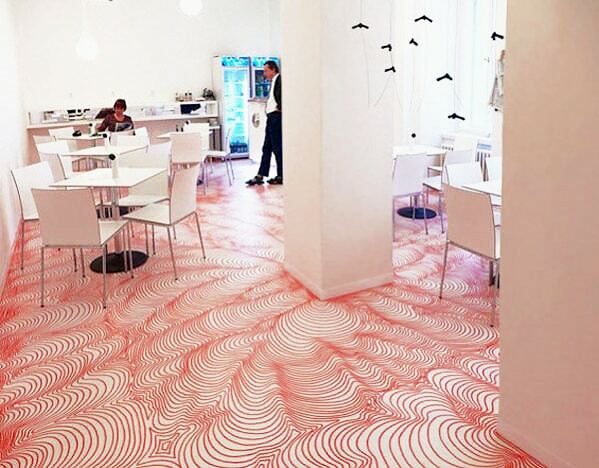 Cafe Bodenlos in Prague boasts a trippy red-lined floor guaranteed to mesmerize. Drawn in undulating waves, the design is a captivating modern style that’s as much a floor covering as installation art. It takes some serious level dedication and hard work to create DIY floors. 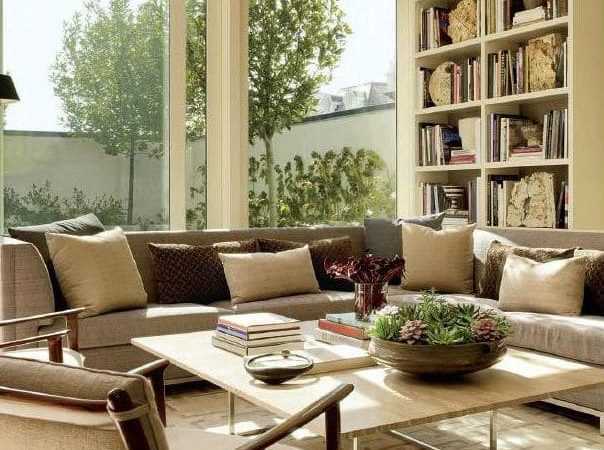 If you find a design you are passionate about, seeing it finally take a place in your home is priceless. But for those out there who are craft challenged like me, an antique rug is all the art we’ll need to keep art underfoot! What DIY projects are you most proud of? Let us know in the comments below! 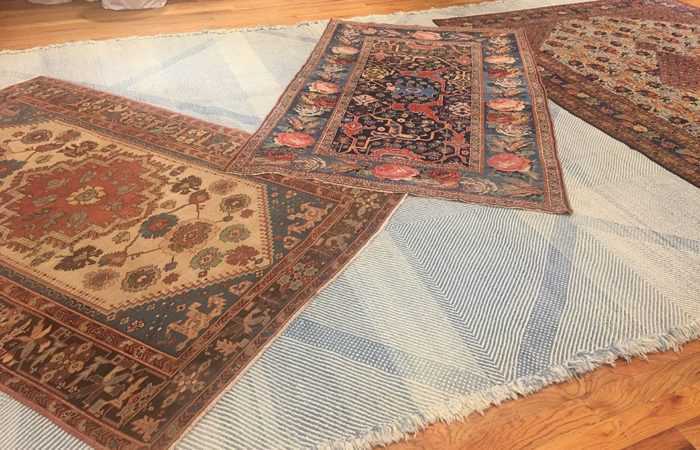 This interior design blog about DIY Home Projects: Fabulous Drawing Marker and Penny Floors was published by: Nazmiyal Antique Rugs located in the heart of Manhattan, New York city.